We were looking for a photo of Mr. Kaliski. Here is the man himself. Mr. Raymond Simmons was able to get hold of some family and has compiled a family tree of him as well. Here on Saba he was known to all as Herman Kaliski. Everyone knew him or had heard stories about him and his clothing store at 27 South Street. This is where the Seaport Museum is now located on Manhattan. Mr. Frederick Augustus Simmons founder of the Saba School of Navigation from which over one hundred young boys from Saba graduated. Many of them went on to become famous captains. In all other cases Kaliski would suit him out with a year’s worth of clothing and other seaman’s gear, find him a schooner and get him shipped out to China or wherever the ship would be bound to. Kaliski served not only as a clothier, but as a banker, a post office, a social gathering place where the Saban sailors could meet and relax. He did not allow any drinking in his place but next door was Mr. Baum’s rum shop which was quite convenient. I only found at recently that Mr. Kalisky also had a boarding house at 25 South Street at which many of the Sabans used to lodge. 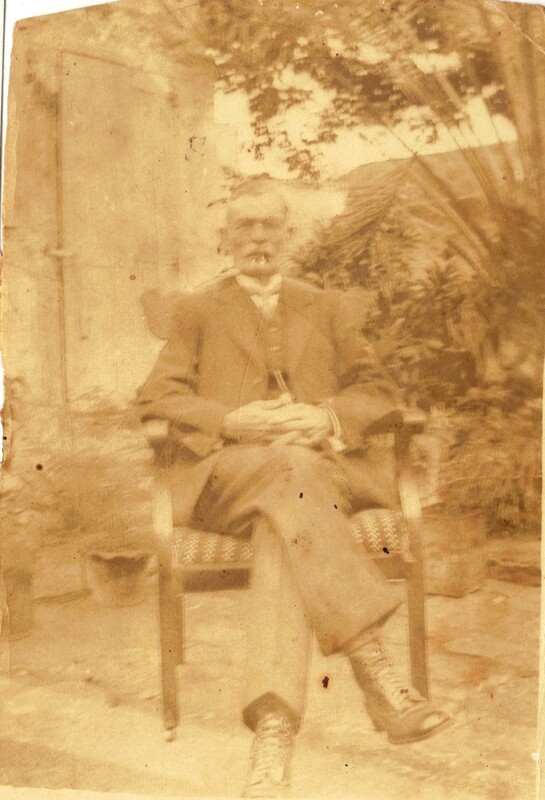 One such lodger was my friend Ronald Leverock’s grandfather John James Hassell. This was brought to my attention by Ron’s wife Mary. John James was born on Saba on July 2nd. 1870. He was first mate on a ship and took in with the influenza. Despite Mr. Kaliski’s best efforts Mr. Hassell got worse and had to be taken to hospital. John James’ brother in Maryland was notified. Mr. John James died at the age of 50 on January 8th, 1921. Mr. Kaliski was so popular with the Saba people for almost 40 years that some people on Saba added the name to their children. I know of at least one Kaliski Jackson who died young, but there were also one or two others born in New York of Saba background. During his many years of his honest dealings with Saba people there are a number of transactions recorded in the registers here on Saba mentioning his role of which I will only mention two. Power-of-Attorney to Herman Kaliski residing New York City from Henrietta Johnson residing Windwardside to collect $1.000.—due to her by the order of the Macabees. Saba, March 7th, 1919. Power-of-Attorney; Annie Peterson born Hassell residing Windwardside empowers Herman Kaliski resident of twenty seven South Street N.Y.C. to collect monies left her by her deceased husband Edward Beaks Peterson (lost at sea). Back then many sailors and captains from Saba were lost at sea had savings in the Seamans Bank in New York or life insurance, back wages and so on and Mr. Kaliski took care of all these matters for the families here on Saba. And he did this free of charge. He got to know the Saba people and Saba so well that even though he had never been here he seemed to know every inch of the island. He was a big joker as well. Captain Irvin Holm told me that once he was in the store talking to Mr. Kaliski who had noticed Ainslee Peterson walking into the store. Kaliski had overheard both Ainslee and Wilson Johnson having heated arguments about sheep in the past. So he said to Capt. Holm:”It’s a crying shame what Wilson has done.” That got Ainslee’s attention right away. Kaliski went on to say that Wilson had gone down behind Old Booby Hill and shot all of the sheep that were there. Well Ainslee was immediately ready to quit his job and to head down to Saba to deal with Wilson. Capt. Holm said it took a long time to convince Ainslee that Kaliski was only pulling his leg. 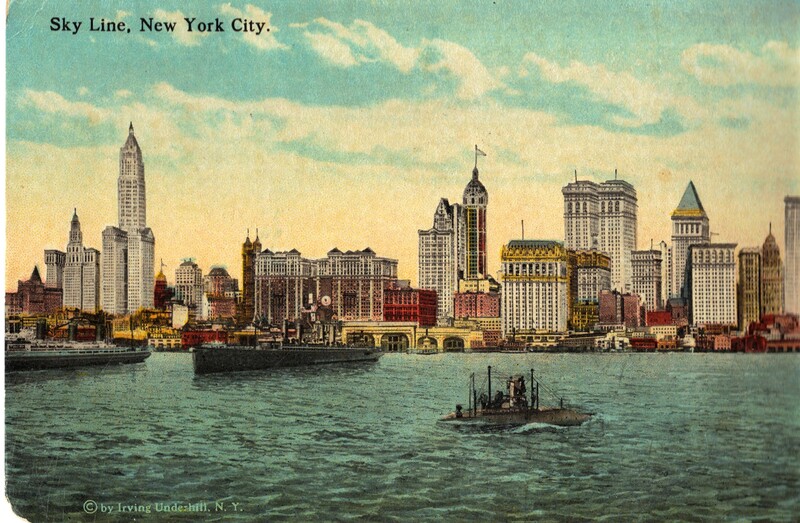 Skyline of New York City as it would have looked back in the day. 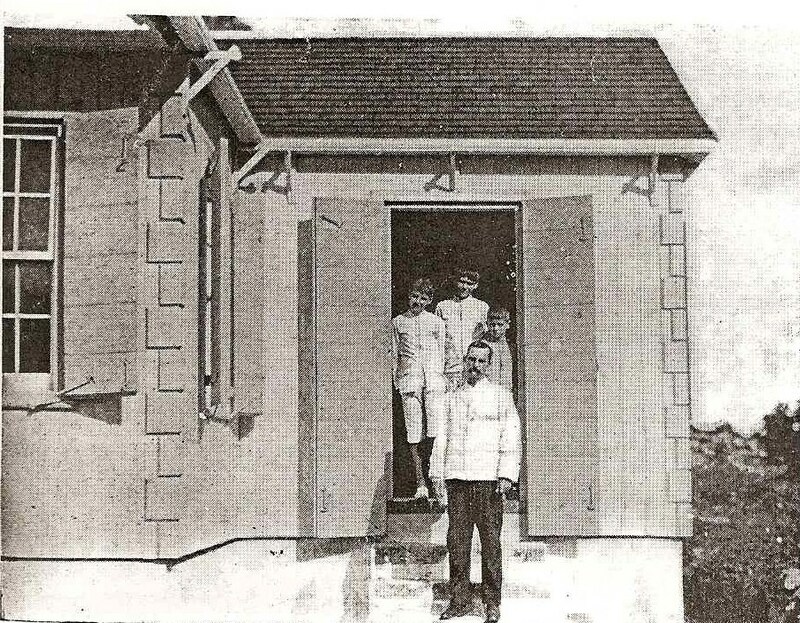 Mr. Henry Hassell Johnson left Saba at the age of 12 barefoot and illiterate to work on Schotzenhoek plantation On St. Eustatius which was owned by the Every family of Saba/St. Eustatius. Within a few years he was the biggest businessman on St. Eustatius and the Schmidth lady he met and married learned him to read and write and to calculate as it did not take him long to become a millionaire when the island was a poorhouse. Another story I heard was that those sailors who could not read or write would entrust Kaliski to read their letters to them from their wives back on Saba. One day he was reading a letter to Phena Holm from his wife. She was telling how the fog had just moved in and it was getting cold. Kaliski decided to add some romantic relish to the story, when Phena jumped up and grabbed the letter from him saying:”Now look here Kaliski, this is private. I will read the rest of the letter myself.” I think Norman Hassell told me that one. Helen Peterson/Johnson was telling me sometime back how her grandfather Henry Hassell Johnson of St. Eustatius fame had left his money belt on the floor of the bathroom at Kaliski’s and lucky for him Richard “Rich” Hassell the next customer had found it lying on the floor and returned it to him. In those days when you went to do business in New York it was all cash transactions. The Money belt contained twenty thousand dollars an enormous sum of money one hundred years ago. Henry Johnson and other merchants from Saba would use Kaliski’s place to meet with suppliers and load up the Saba schooners at Pier 17 or at Greenpoint. “ Hyman Kaliski was born in Germany around 1866. I have been unable to obtain a record of his death. He had apparently moved out of New York City before he died. There is no record of his applying for U.S. citizenship. He may have become a citizen when he married and American-born woman. In the 1905 New York census he stated that he had been in the country twenty-five years. This would mean he arrived in 1880. The 1915 New York census, which misspells his name “Harris Kaliski,” states that he had been in the country only twenty-eight years. He has been described as a “Russian Jew,” but I found no evidence of a Russian background. His father’s name on his marriage certificate is Henry Kaliski, and his mother’s maiden name is given as Tilman. Both were born in Germany. 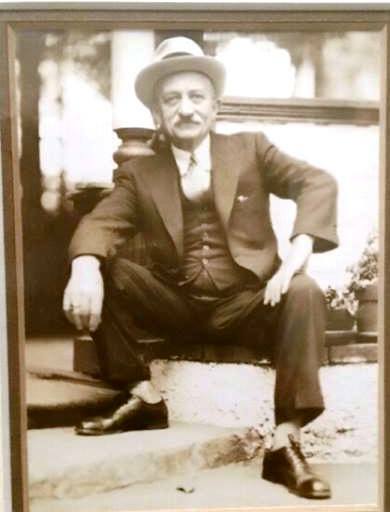 Prior to establishing his own business, Hyman Kaliski was apparently associated with a Jospeh Kaliski in a store at 72 Greenwich Street on the west side of lower Manhattan, and later with a Gustav Kaliski in a store located at 26 Greenwich Street. A Joseph Kaliski who died in the Bronx in 1938 at the age of eighty-five could have been a brother. So far I haven’t been able to confirm this. He would have been thirteen years older than Hyman. A Gustav Kaliski born in Germany who died in Manhattan in 1925 at the age of seventy-one could have been a brother twelve years older than Hyman. Gustav’s death certificate lists his father as Hyman Kaliski, and his mother as Marie “Tinbman,” both born in Germany. The Gustav Kaliski who had a clothing store at 26 Greenwich Street applied for citizenship on June 30, 1880. A son named Leonard born around 1907. Alma and Sadie (I must be part Jewish, my mother and sister had those names) were married in 1912, in a double ceremony at 80 West 126th Street in Manhattan. Alma married David H. Wachsman of 563 Amsterdam Avenue, the son of Samuel Wachsman and the former Ethel Feldman. He was twenty-four, born in Hungary, and his profession is given as salesman. Sadie married Reuben A. Popkins of 108 West 115th Street, the son of Israel and Sarah Popkins. (Her maiden name is illegible.) He was thirty, born in New York City, and his profession is given as clerk. The Saba schooner the “Ester Anita” docked up at the South Street Sea Port. 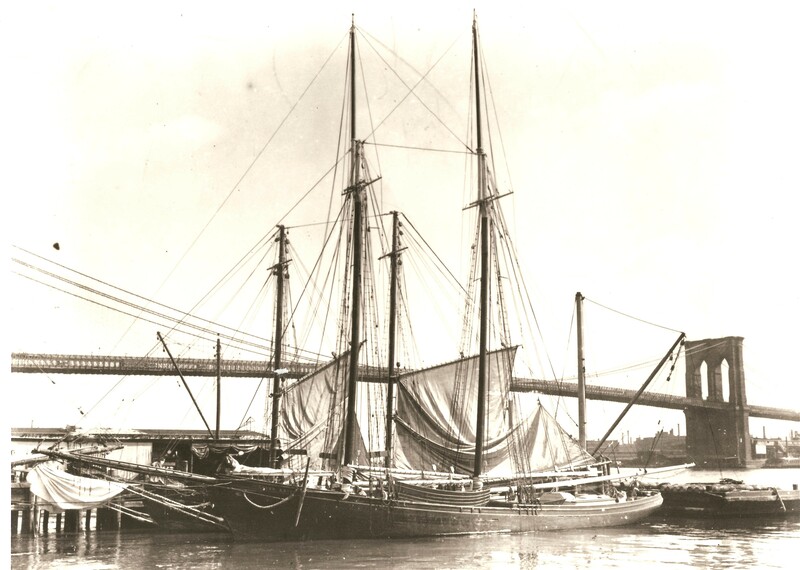 For more than a hundred years Saba schooners plied the trade from the Eastern Caribbean islands to New York, carrying cargo and passengers. Henrietta Kaliski was married on June 22, 1924 to Leonard Leon of 470 West 146th Street. He was 30, born in Warsaw, Poland; and his father’s name was Lazarus Leon. Harry Kaliski was married on December 3, 1923 to Grace Skinner of 31 Arden Street. Harry Kaliski died September 4, 1946 at 1781 Riverside Drive at the age of fifty-one. His profession was listed as liquor salesman and he was a veteran of World War 1. Hyman Kaliski undoubtedly has surviving descendents. The remaining son Leonard may also have married, but I have not located that information yet. I could not find the two oldest daughters in the 1915 or 1925 New York State censuses under their married names. They had apparently moved out of the city soon after their double wedding. Records of births in New York City after 1909 are more difficult to research as they are still held by the Health Department. The fact that the seamen from Saba remembered Hyman Kaliski having three daughters suggests that they were still in the New York area, and may have been helping out with the business. 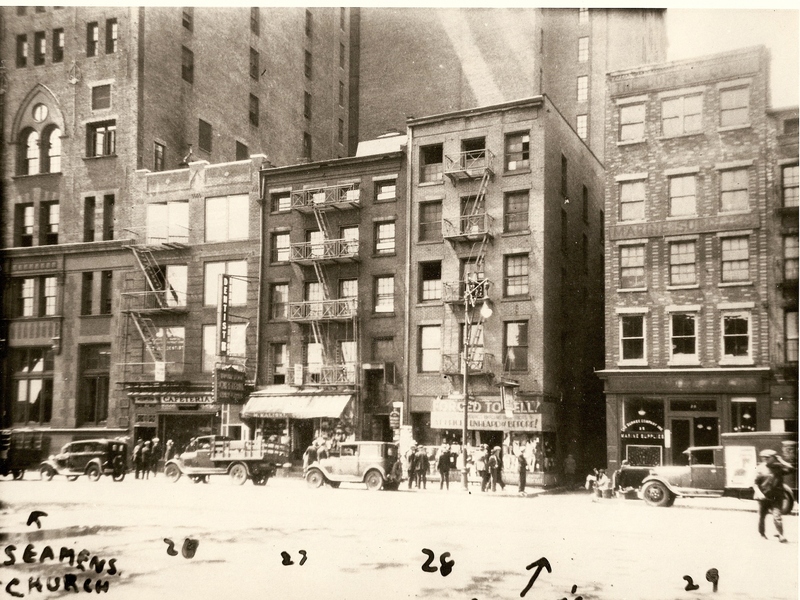 Mr. Kalisky’s place at 27 South Street, New York where Saban sailors made their homes while on shore. The name Kalisky is on the awning behind the truck. When I have time I will look for Leonard’s marriage, and see if I can find children of Harry, Henrietta, or Leonard born in New York City in the Health Department records. Tracing Alma and Sadie, and Hyman himself, after they left the City, is going to be more difficult. City Directory entries: 1891-92 Hyman Kaliski – 72 Greenwich St. –men’s furnishings home 100 Henry St.
1910 -11 Hyman Kaliski – 27 South Stret –men’s furnishings. Home 108 West 115th Street. 1933-1934 Hyman Kaliski -27 South Street- clothier wife Nettie. Home 66 Fort Washington Ave. A Leonard Kaliski at same address. This was the last business directory published. Capt. 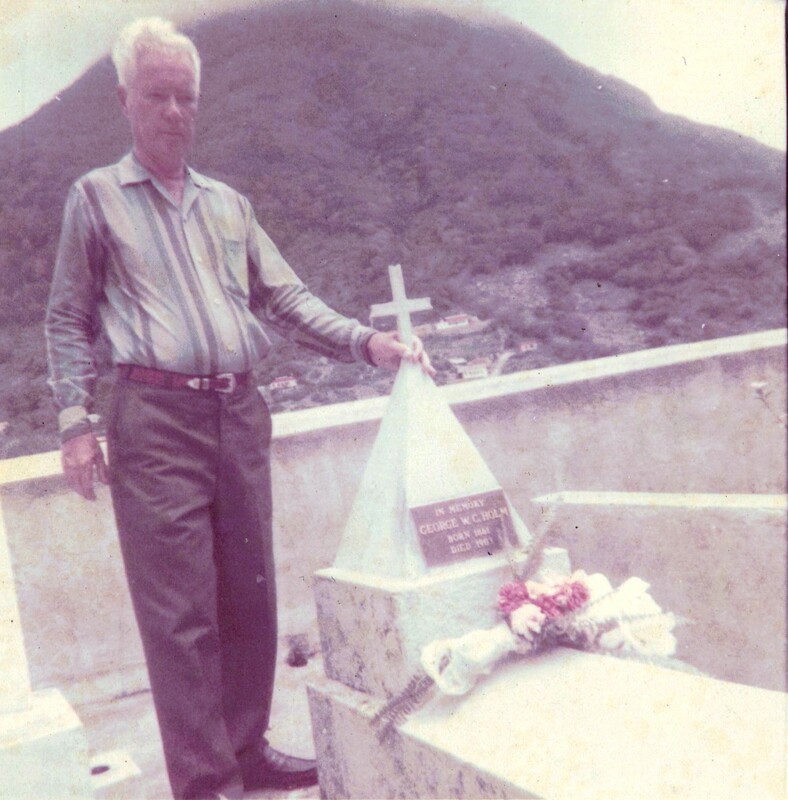 Irvin Holm here at his fathers grave on Saba. He lived to be 93. Capt. Irvin Holm told me that when Mr. Kaliski was doing business on Greenwich Street that some sailors from Saba had made friends with him. This friendship intensified once Mr. Kaliski moved his business to 27 South Street close to pier 17 where the Saba schooners would dock up. So it is safe to say that from around 1890 or so until 1940 thereabouts he was doing business with the Saban sailors. No wonder he knew the “Back of Old Booby Hill” and how to irritate Ainslee about his sheep there. Capt. Holm told me that as the Sabans moved to Barbados and later to Richmond Hill with their families, they got land based jobs especially in the United States. No more sailors were coming from Saba. Capt. Holm said that when he went to visit Mr. Kaliski he was lamenting the fact that he no longer saw his Saba friends whose interests he had been serving for at least fifty years. When I was a boy you could hear the old sailors telling all kinds of stories about Mr. Kaliski and his Saba headquarters at 27 South Street. The entire area is now the South Street Seaport Museum. I have been there several times. A worthwhile visit for anyone from Saba to make contact with the past when here was swarming with sailors from a small Caribbean island. As I was typing this article, in between, I was also busy scanning some of my photos. 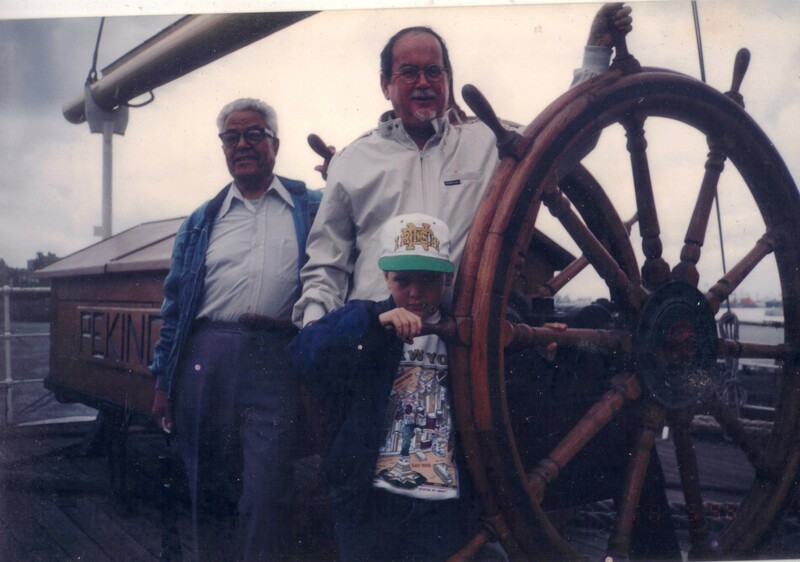 When the article was almost finished the next photo to be scanned was of James Jackson with my son Peter at the South Street Seaport Museum in 1996. James had a brother named Kaliski Jackson. What a coincidence I thought to myself, so I scanned it right away and it will form part of the story. Here visiting the South Street Seaport museum with my son Peter Charles Albert Johnson at the wheel of the “Peking” and with James Jackson (brother of Kaliski Jackson) looking on. If you ever visit the Seaport Museum in New York, while there, say a prayer for the sweet repose of Mr. Hyman Kaliski a true friend of the Saban sailors of the past and Saba’s former ambassador to the great City of New York.